Church people and rights activists light candles against Duterte's 'tyrannical' rule. Photo by Kevin Aguayon. 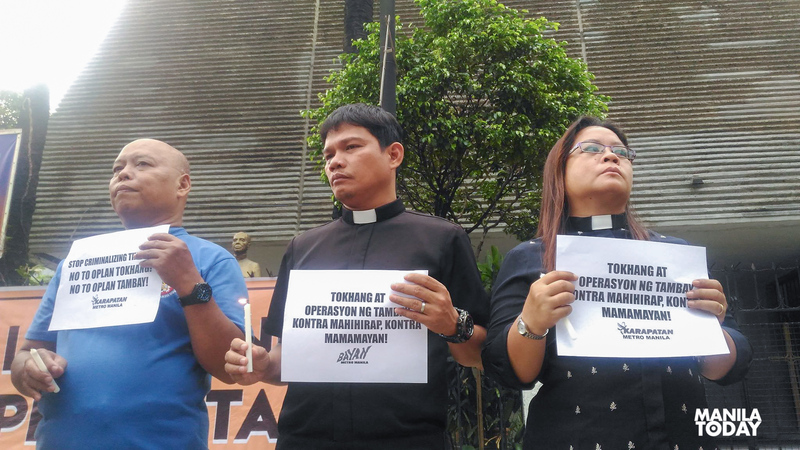 Movement Against Tyranny Metro Manila held a candle-lighting activity today in condemnation of Philippine National Police’s (PNP) “oppressive” Oplan Galugad which resulted to the massive arbitrary arrest of almost 8,000 individuals in less than a week. The group also called for justice for Genesis ‘Tisoy’ Argoncillo who died suspiciously inside his cell 4 days after his arrest last June 15. MAT Metro Manila decried PNP’s unlawful operations on urban poor communities as it escalate human rights violations and “targets only the marginalized”. According to reports, among the thousand arrested, most are from poor communities. “Oplan Galugad is a ‘dry-run’ of a massive crackdown against dissent and the people; an openly coercive measure of the fascist state to impose undeclared Martial Law across the country primarily victimizing the poor and the powerless,”Movement Against Tyranny Metro Manila convenor Rev. Dionito Cabillas said. “We are highly alarmed as the nation is placed under threat Movement Against Tyranny Metro Manila convenor the death of Kian, militarization on the countryside, Martial Law in Mindanao, killing of priests, and now the arrest of ‘tambays’. This is a rehash of a Marcos-style dictatorship,” said Rev. Cabillas . “The death of ‘Tisoy’ is only the beginning. No one is innocent in the eyes of tyranny and darker days are sure to come,” he added. The group also reiterated the call for the resumption of peace negotiations between the Government of the Republic of the Philippines and National Democratic Front of the Philippines. They emphasized that the substantive reforms that could be achieved through the talks would resolve issues like criminality, as well as the inflating number of ‘tambays’, which is only an effect of rampant unemployment and absence of genuine national industrialization. “It’s been two years since Duterte assumed presidency, ‘change is coming’ is his fearless forecast, still there’s nothing for the people except economic disaster and tyranny. He must be reminded that these are among the reasons why his celebrated dictator Ferdinand Marcos was overthrown,” Rev. Cabillas said. The group also hit Duterte for criminalizing dissent and maligning activism and for his lashing out at churchpeople. “Duterte’s insensitivity towards religious belief manifests in the perpetuating attacks against priests. In less than a year three priests were killed,” Rev. Cabillas said. “With nothing left to lose, the people are being pushed to resist and fight back; for their rights and for justice and peace,” he added.